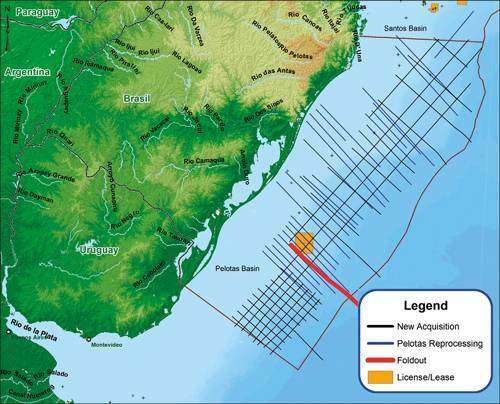 Located south of the Santos Basin and comprising all the Brazilian coast south of the Island of Florianopolis, the Pelotas Basin is a large, untapped 280,000 km2 hydrocarbon province on the southeast coast of Brazil, bordering Uruguay to the south. Up to 7,000m thickness of Cretaceous and Tertiary post-rift clastics have been deposited in the basin, including both Paleocene and Albian source rocks. These source rocks are actively generating hydrocarbons today and there are seismic indications of an active, working petroleum system similar in character to those found in the Niger Delta in West Africa. This similarity with the Niger Delta is an important indicator of pre-salt potential, which can be both in shallow and deep waters, however the presence of carbonate rocks would have to be confirmed. According to Spectrum, recent high quality 2D seismic data has imaged multiple potential reservoirs, traps, source rocks and direct hydrocarbon indicators in the basin. 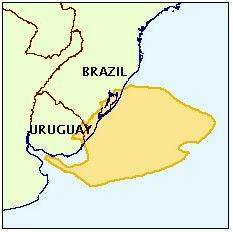 The new seismic data shows that since the beginning of rifting between South America and Africa (around125 million years ago), the mouths of paleo tributaries of the Rio de la Plata (la Plata River)moved along the margin several times. The most recent depocenter comprises a 4 kilometer thick Tertiary clastic sequence which displays a world-class direct hydrocarbon indicator in the form of a 40,000 km2 sheet of Bottom Simulating Reflectors (BSR), which are confined inside the 3,000m Tertiary isopach (isopachs indicate thickness variations within a layer). The Tertiary delta has prograded (grown farther out into the sea over time) over, and matured, a Paleocene source rock, and gas and condensate from this source rock subsequently migrated up through the prism via abundant gas chimneys and plumes, to be trapped by the gas-water crystal phase change creating the BSR.Along with new provinces discovered in the Sergipe-Alagoas Basin in the northeast and along Brazil's northern Equatorial Margin, the Pelotas Basin is one of the new frontiers in O&G exploration in Brazil, and all highly promising in hydrocarbon quality and quantity. Published in Geo ExPro, No. 4, September 2013.